Theatre in Education is more than simply a drama performance. 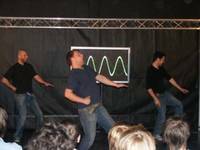 It describes a programme, which can comprise a performance supported by active audience participation, often in the form of interactive workshops. These are facilitated by the performers or teachers using a variety of techniques. TiE programmes are often supported by teaching materials designed to encourage further work following the visit, or preparatory work prior to the visit. TiE should not be a one-off, stand-alone intervention but the catalyst for, or reinforcement of, other work. Frankie, Jay and Andy are three friends in the prime of their youth. Clubbing, football and hanging out with the girls are just a few of their favourite hobbies - so when Frankie's girlfriend, Stacey, and her best friend Lucy, agree to join the boys for one of their "big nights out" - arrangements are made to guarantee a good night is had by all. Time to call on Ezee: a friend with contacts who can "sort things out" in order for this to happen. Plans are made and everything is set for a Friday night to remember. But their evening soon takes a tragic turn when Andy crashes his car en route to the club. In the face of the aftermath, friendships are tested and questions asked, as the group struggle to deal with the consequences of an accident that should never have happened. Incorporating a unique blend of film and live theatre, Wasted is a powerful and groundbreaking drama, which explores the issue of drug driving within modern youth culture. 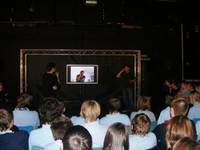 Aimed at Year 10 and above, this educational drama seeks to address some of the moral issues linked to driving under the influence of drugs. www.walkingforward.co.uk.